More than eight million people tuned in to watch the BBC's new £8m drama series Robin Hood, unofficial overnight figures show. 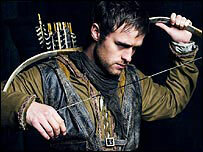 Ratings for the first episode, starring Jonas Armstrong as Robin Hood, averaged 8.2m. It beat ITV1's Ant and Dec's Saturday Night Takeaway with 7m. The new series of Strictly Come Dancing beat ITV1's The X-Factor, with 8.8m and 8.4m viewers respectively. BBC One controller Peter Fincham said he was "thrilled" with the ratings. 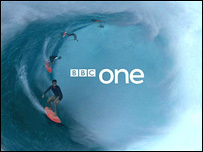 Saturday also saw the launch of the new BBC idents, which feature kites, surfers and swimming hippos, while the National Lottery: 1 vs 100 attracted 6.2m viewers. The show, hosted by Dermot O'Leary, coincided with the second part of The X-Factor, which reached a peak audience of 9.2m at 2100BST. During The X Factor judges Simon Cowell, Sharon Osbourne and Louis Walsh whittled down the contestants to 12. An ITV spokesman said: "We are thrilled that nearly 10 million people tuned in to discover who were the final 12 acts who will go on to sing on the live shows next week." Robin Hood, which also stars Keith Allen and Richard Armitage, has been updated for the 21st Century. Green tights have been replaced with trendy medieval attire, including combat trousers, desert boots and even a hoodie for the lead character. Robin Hood had a peak viewership of 8.5m compared to 10.5m for the first episode of Doctor Who in 2005, which at the time starred Christopher Eccleston and Billie Piper. Mr Fincham said: "I'm thrilled that last night's schedule proved such a hit with BBC One audiences. "A very strong start for Robin Hood, followed up by an exceptional return for Strictly Come Dancing, and 1 vs 100 is really hitting its stride. "Together with the launch of our new idents, this was an important day for BBC One."